One of the well-defined roles of PP2C in cell signaling is the downregulation of the stress-activated MAP kinase cascades in eukaryotes. A MAPK cascade is composed of three kinases: mitogen-activated protein kinase (MAPK), MAPK kinase (MAPKK), and MAPKK kinase (MAPKKK). Extracellular stimuli are transmitted into the nucleus through sequential phosphorylation of these kinases; a signal-stimulated MAPKKK phosphorylates a specific MAPKK, which in turn phosphorylates the conserved threonine and tyrosine residues of its cognate MAPK . Subsequently, an activated MAPK phosphorylates and activates nuclear transcription factors, inducing a set of genes for cellular responses. Consequently, dephosphorylation of any of the kinases in the cascade results in downregulation of the final outcome. Figure 1 Downregulation of the Spcl MAP kinase by PP2Cs. The Wisl MAPKK is activated by extracellular stress phosphorylate Thr-171 and Tyr-173 residues in the activation loop of the Spcl MAPK. Subsequently, activated Spcl phosphorylates downstream transcription factors, which in turn induce stress response genes as well as ptc1+ encoding a PP2C phosphatase. 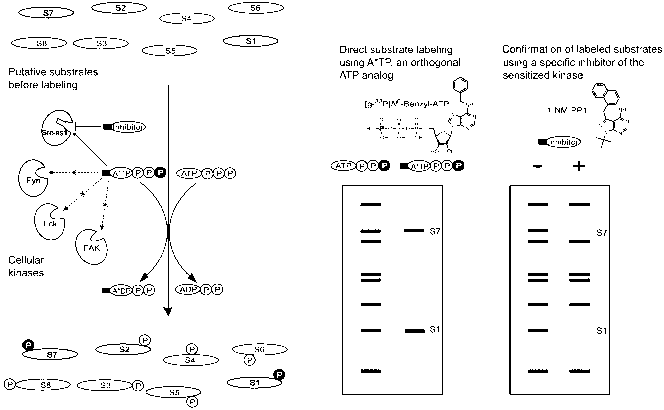 Ptcl dephosphorylates Spcl Thr-171 to inactivate the Spcl pathway. Ptc3, the other PP2C dephosphorylating Spcl, is expressed constitutively. Phosphorylation of Spcl Tyr-173 is negatively regulated by two tyrosine-specific phosphatases, Pypl and Pyp2.
. Interestingly, the ptc1+ gene is transcriptionally induced by activation of the Spcl pathway, while the ptc3+ gene is expressed constitutively . Thus, PP2C participates in suppressing the Spcl MAPK under normal growth conditions and in a negative feedback regulation of Spcl activated by stress (Fig. l). In budding yeast, a PP2C enzyme, Ptcl, dephosphorylates Thr-l73 of Hogl MAPK, the equivalent of Spcl Thr-l7l in fission yeast [l0]. PP2C regulation of stress MAPK cascades is also conserved in mammalian and plant systems. Mammalian cells have two stress-activated MAP kinases, p38 and JNK. PP2Ca inhibits both MAPK cascades by dephosphorylating p38 and its MAPKK, MKK6, as well as the SEKl MAPKK upstream of JNK [ll]. The p38 MAPK is also inactivated by a PP2C5 isoform, Wipl [l2]. Wipl is transcriptionally induced in a p53-dependent manner in response to a variety of stresses such as y-irradiation, ultraviolet irradiation, and H2O2. Moreover, Wipl induction depends on the p38 MAPK, which phospho-rylates and stimulates p53 in response to ultraviolet irradiation. 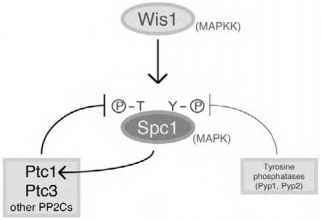 Thus, like the Spcl MAPK and the Ptcl phosphatase in fission yeast, the mammalian p38 MAPK and Wipl PP2C5 form a negative feedback loop. Recently, Wipl-deficient mice have been generated that exhibit defects in reproductive organs, immune function, and cell-cycle control [l3]. In alfalfa plants, a stress-inducible PP2C, MP2C, was identified as a negative regulator of the stress-activated MAPK cascade [l4].